Some people out there are hiding behind a screen, sitting on a corner and spouting wise. 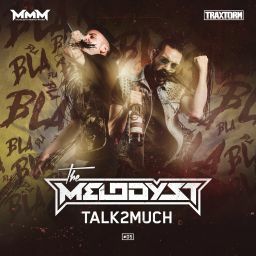 The Melodyst are releasing a new EP: “Talk2Much” to set apart from this people and state their position: they fight against music standardization expressing their emotions through their music. In Talk2Much there is no space for melodies. A memorable drop, a raw women’s vocal and strict & soaring rhythm are the cornerstones of this track. The EP contains also another musical statement: “Chaos Culture”. Without any doubt this track aims to restate the old tunes with a modern twist.